Hee Pio soup or Kuah Hee Pio as some would call it, is to many is a “ceremonial” soup, whose plenitude of different ingredients and components symbolically signifies riches and abundance. 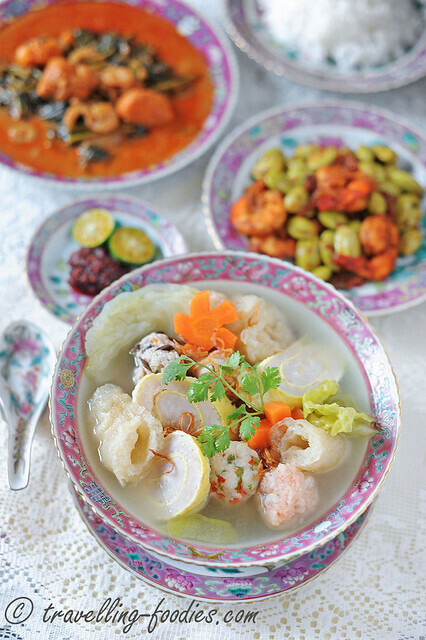 Unlike other simpler soups like Pong Tauhu or Bakwan Kepiting which are deemed more “daily meal”- like, Hee Pio Soup is much more laborious to prepare as everything is usually made from scratch. Of course one could decide to be “tak kuasa” and buy readily available fish balls, pork balls and prawn balls from the supermarkets but as every other baba or nyonya would put forth staunchly, “nothing beats those made by the very hands of my own grandmother”. I won’t disgree on this for Hee Pio Soup as the commercially available ones simply have too much starch added as a binding agent and often not enough meat ratio. When the balls are made at home, we can control the amount of starch added to make the natural sweetness from the meats come through more easily. The ingredients list for Hee Pio Soup is a very long one and so is the procedure. Not meant to be intimidating, it is significantly longer compared to the other soups like Pong Tauhu or Buah Paya Masak Titek. 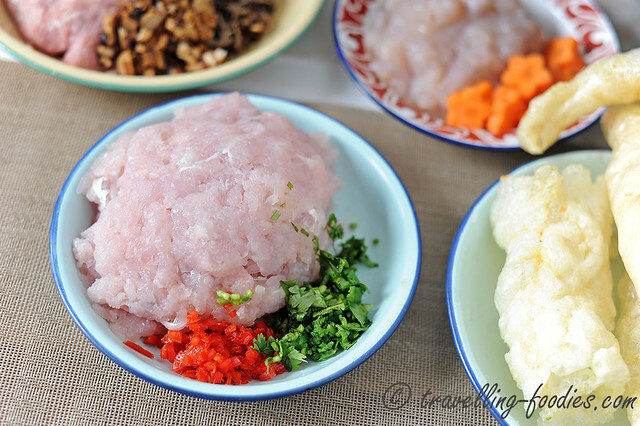 Apart from fish maw, three different types of meat balls which goes into the soup are made by hand. For pork balls, the technique de facto is to buy a nice piece of pork belly and mince it ourselves at home. I still remember fondly watching my grandmother do it whenever she needs to cook Pong Tauhu, Ngoh Hiang or Sotong Sumbat Babi. The rhythmic mechanical workings of her Chinese cleaver still rings in my head in fact. 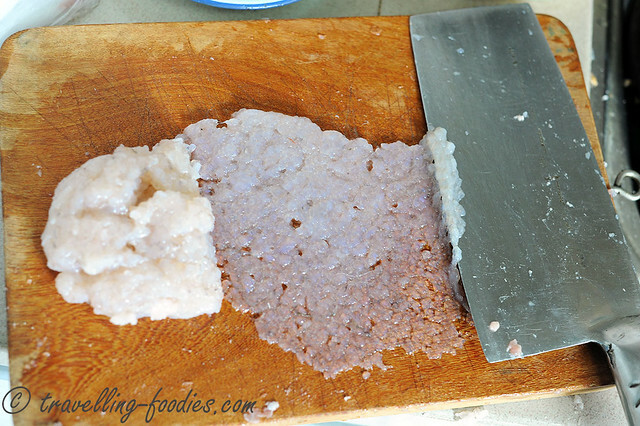 Nowadays, we could get minced pork easily from the supermarket or at the butchers so one doesn’t necessarily have to mince it ourselves anymore. But the act of mincing pork the traditional way is kind of therapeutic if you ask me. There are two types of fish maw commonly available now. One is from threadfin (ikan kurau) while the other from eel (ikan belut). The former is often deemed more superior and markedly more expensive but both works equally fine if you ask me. They can be differentiated by their physical appearance as eel’s swim bladder from which the “fish maw” is made is noticeably more elongated and slender than that from threadfin. It is important to soak the fish maw in some warm water until it is slightly soften first before processing. Not only is it easier to cut, but it also allows the oils which were used to deep fry the fish maw to be removed effectively. 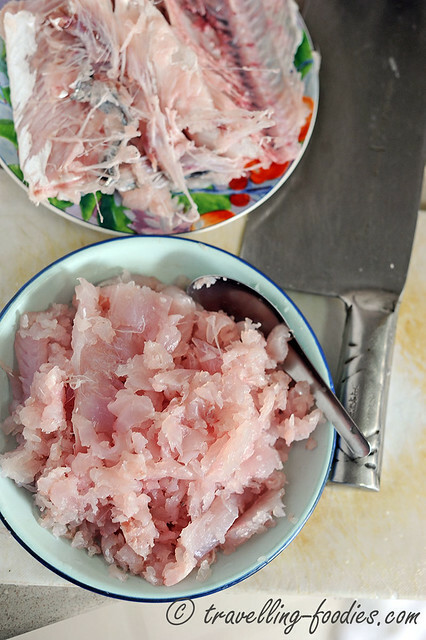 For making fish paste, wolf herring (ikan parang) is the ikan de facto at home. It is quite easy to find in our local supermarkets as “dorab” and quite reasonably priced too. It is however, a tricky fish to handle as it is full of long bones so extra caution is needed to make sure that there are no fish bones in the fish paste scraped from the skin and bone. 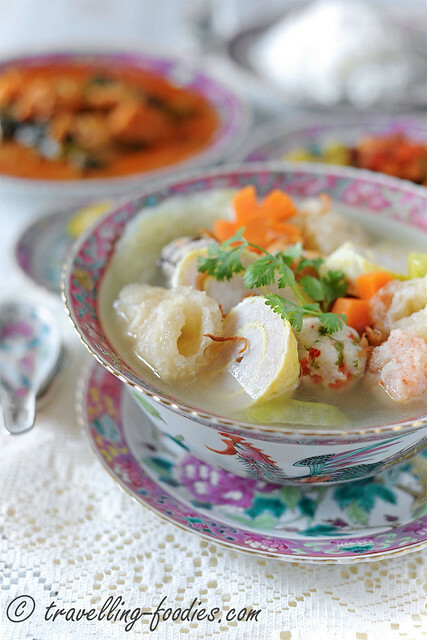 If ikan parang proved to be too finicky to handle, other viable options include yellow fusiler (ikan tauhu) or even spotted mackerel (ikan tenggiri). 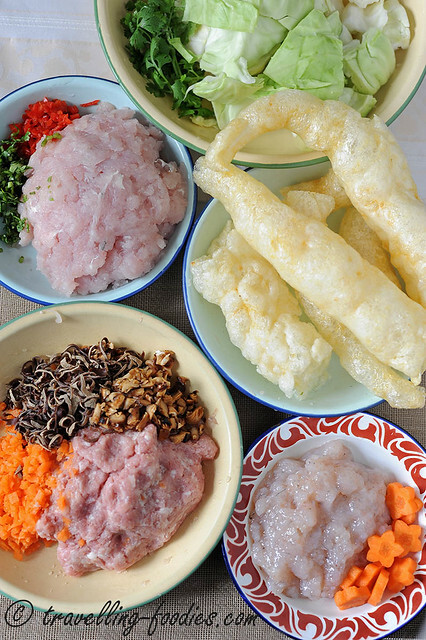 For the prawn paste, I was taught by my grandma to use the side of her cleaver to press down and flatten each prawn to form a paste instead of chopping finely. She told me that this is much faster and purportedly learnt this from a Chinese cooking program many many moons ago. The process is repeated several times to get the paste down to very fine consistency. A definite must-have in the Peranakan version of Hee Pio Soup is omelette fish roll. The omelette should be thin so that it would not crack upon rolling. The right pressure must also be applied to allow for the textural changes in the fish paste as it is steamed. The fish paste tightens considerably, firming up the roll and would invariably cause the skin to crack if it was rolled too tightly to start with. In short, it is not difficult to make but does require a bit of practice to make the egg rolls well. Add pork ribs and bring to a boil again for 10 min. Skim off any impurities and scum from the surface. Lower flame to medium low and cover with lid. Simmer for 45 min. Meanwhile, soak fish maw in warm water until soften. Squeeze out as much water as possible. Rinse with some tap water and squeeze out the water. Cut into 3 cm wide rings and set aside. Mix all the ingredients together thoroughly with clean hands in a mixing bowl or with a food processor and refrigerate for 30 min to marinate. Mix everything together and rub the seasoning in the fish meat with clean hands, feeling for any fish bones at the same time. Rub the ice cubes into the fish meat until the ice cubes have completely melted. Alternatively, everything can be blitz in a food processor until a fine paste is obtained. Refrigerate for 30 min to marinate. ** the ice cubes make the fish paste more bouncy and succulent as I was told. Mix everything thoroughly with clean hands in a mixing bowl or with a food processor. Refrigerate for 30 min to marinate. Mix the fish paste with the chopped coriander leaves and red chilies. Set aside for later use. To a heated frying pan, add 1 tbsp cooking oil and swirl HALF of the beaten egg mixture into the pan to make a thin omelette. Once the omelette is done, remove omelette onto a large and flat plate. Repeat with the other half portion of beaten egg. When the omelette has cooled down slightly, place half of the fish paste onto it and use the back of a soup spoon to flatten and spread the fish paste until it reaches the edges of the omelette. Carefully roll the omelette from one end to the other. Repeat the process with the other omelette and the other half portion of fish paste. Rub cooking oil generously onto a steaming dish. 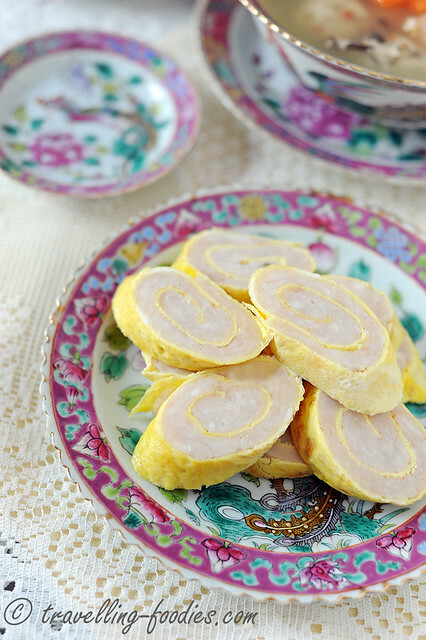 Place the omelette fish rolls onto the steaming dish with the sealing end facing downwards. Steam the rolls for about 8-10 min. Set aside to cool down slightly before cutting into diagonal slices. 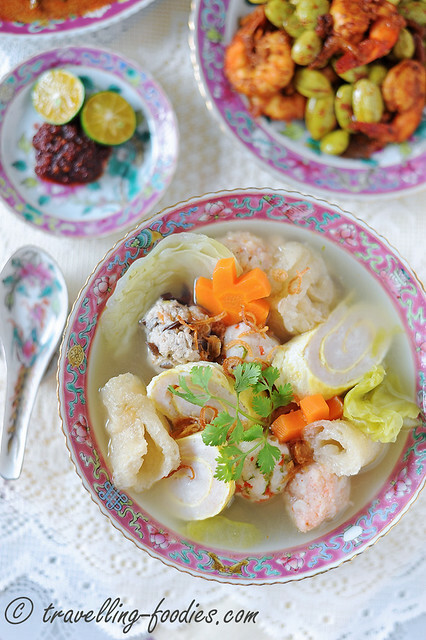 To cook the hee pio soup, add chopped cabbage and sliced carrots into the pot of pork broth and bring to a boil. Lower flame and cook for 10-15 min until cabbage just softens. Add chopped fish maw and lower flame to a bare simmer. Scoop meat ball paste with a wet soup spoon into a palm moistened with some water, and roll into balls, taking care to press down the julienned black fungus, mushrooms and carrots into the minced pork slightly to prevent them from dislodging into the soup during cooking. Carefully lower each meat ball directly into the soup broth. Repeat meat ball making process until all the mixture is used up. Repeat the same process for making fish balls and finally prawn balls. Bring the hee pio soup to a boil again and skim off any scum, impurities and oil from the surface of the soup. Adjust the taste of the broth with salt and pepper (Be careful with the amount of salt to be added as the meat balls have all been seasoned prior). Before turning off the flame, add the sliced omelette fish rolls. To serve, ladle ingredients into a large bowl and top up with soup. Add a dash of ground white pepper, and garnish with coriander leaves, fried shallots or garlic crisps and drizzle over a tbsp of shallot oil. 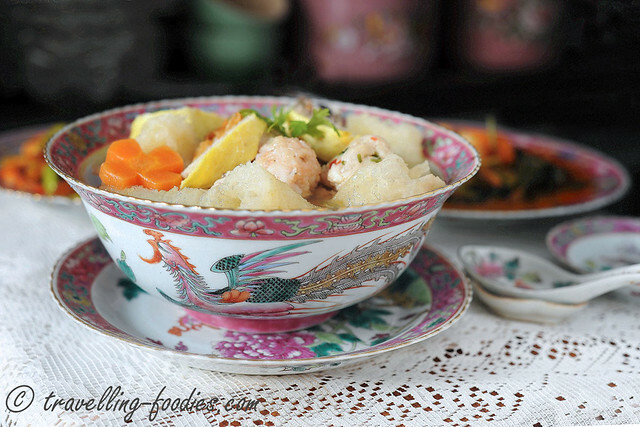 Serve immdiately with steamed rice and other dishes. This entry was posted on September 19, 2014 by Alan (travellingfoodies). It was filed under Food, Simple Eats and was tagged with black fungus, cabbage, carrots, chili, 番薯鱼, daon ketumbeir, daun ketumbar, 西刀鱼, fish ball, fish maw soup, fish paste, Hee Peow Soup, hee pio soup, hee piow soup, hokkien, ikan parang, kuah hee piow, meat ball, minced pork, omelette fish roll, Peranakan, prawn ball, prawn paste, straits chinese, teochew, Tok Panjang, wolf herring, yellow fusiller. Yummy ! It must be very tasty.Have a box of hee pio from CNY hamper. Will make a effort to cook this dish. Tho’ I’ll omit some ingredients – malas. Love your blog.. it has everything I want to eat! Thank you! Looks so delicious! Can I prepare the balls and roll in advance and cook the soup another day? Hi Sharyn, I would suggest that you prepare the ball mix in advance, put them in the chiller and roll them the next day instead. I am not sure if the balls would stay in shape if you roll them the day before. Precooking them is not a good option too because they will release the flavours into the cooking water when all the goodness should have gone into the soup!